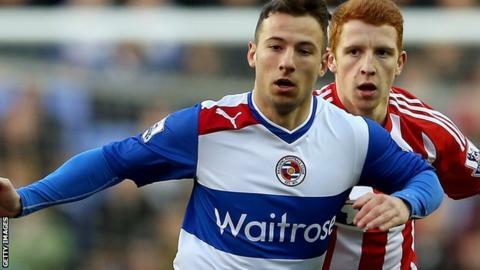 Reading striker Adam Le Fondre says he is unsure whether he will still be at the club next season because of the uncertainty over ownership of the club. The Royals are searching for new owners with chairman Sir John Madejski saying new investment is "critical". Le Fondre is one of several Reading players attracting interest and may have played his last game for the club. "The talks about my contract have been completely kaput," Le Fondre, 27, told BBC Radio Berkshire. The club have several key players out of contract and Le Fondre added: "I've been disappointed with the season I have had personally, I've not played well enough or scored enough goals. "I have no idea (what the future holds). You know what is going on with the club and the takeover, so I don't know what will happen to be honest. I don't know what they will do with me." Le Fondre scored 15 goals this season and said he would be open to staying at the Championship club, who narrowly missed out on the play-offs. "If they want me that will entail a new contract," he said. "Yes, I want to stay, I'm settled. My little girl is in school here, so we'll see what happens." Manager Nigel Adkins has also asked for the club's board to address the financial uncertainty, so he can start building his squad for next season. Madejski holds a 49% stake in the club and Anton Zingarevich owns the rest, but has been looking to sell since October. Initially, Zingarevich had planned to wholly own the Royals, but in late 2013 the club confirmed that deal was dead. "Anton Zingarevich brought me to the club and there was a lot of conversation off the back of that," said Adkins. "Going into the summer window I wanted to bring more players in and that didn't happen - and in January we didn't bring anyone in. "There are a lot of players out of contract and that has to be addressed. I need to sit down with the board and understand where we are financially. "We have to allow Sir John and the board of directors to come up with a plan for the future. The business of the football club has to be right."